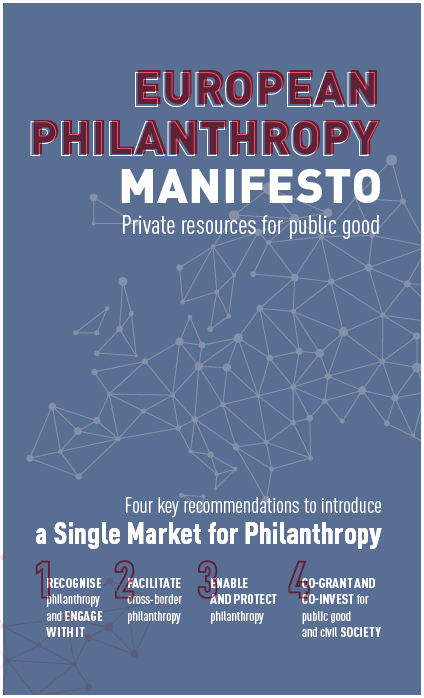 During an informal meeting held on Wednesday 20, 2019 in Brussels, with Members of the European Commission, and attended by various representatives of the European philanthropic sector, including the Fondation de Luxembourg, DAFNE and the EFC officially launched the European Philanthropy Manifesto. The European Philanthropy Manifesto is a call to policy makers in Europe to work towards a Single Market for Philanthropy which includes a better recognition of philanthropy in EU legislation as well as at national level; supports cross-border philanthropy across the EU; and decreases today’s barriers for philanthropy in order to leverage the impact of donors’ and foundations’ spending of private resources for public good. Read the full Manifesto by clicking here.